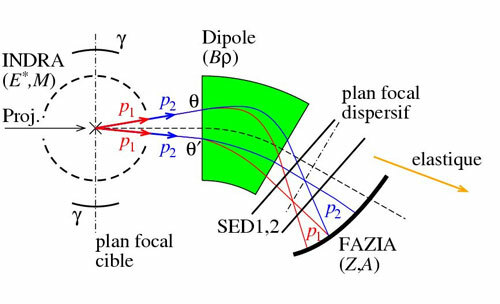 The “inversed spectrometer” method : this method involves placing an isotopic multidetector like the FAZIA prototype on the dispersive plane of a spectrometer. The spectrometer is then no longer used for identifying fragments but instead for characterizing their kinematics. This way, two-particle correlations can be studied. Such a system could for example turn out to be extremely powerful in studying alpha condensates (see Figure 1). The direct use of the FAZIA prototype at the target exit instead of a spectrometer for identifying reaction products. This mode has the advantage of offering large angular acceptance with a very small footprint and would be ideally suited for fitting to ORGAM3 (the Germanium multidetector in the ALTO installation), especially with the relatively light beams from the Tandem (around mass 40). It goes without saying that the problems linked to elastic components must be studied in detail.